New Bandit rider from NZ wanting advice. I just purchased a 2005 GSF1200 K4 very tidy low miles runs great. However the previous owner did some mods aftermarket can and K&N filter. 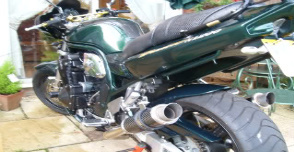 My mate who is an experianced rider and has owned many Suzuki models including Bandits Busas ect said it is running slighty rich and is lacking a bit of power because of that. I was told that the 1200s can take an after market can or a K&N filter without the need to rejett, but with having both mods I was told its would need to be re jetted. What should I do? go back to the original filter or what?